Order custom bottle openers from LogoTags, the industry leader in pricing, quality, selection and service. Our personalized keychain bottle openers make fabulous wedding and party favors and are a time-tested marketing giveaway for businesses and organizations. What makes ordering promotional bottle openers from LogoTags even better are our low factory direct prices. So keep in mind, the more you buy, the more you save. These bottle openers can be slipped right into a wallet. A very cool way to promote your brand. Also, wedding guests love receiving them as favors. We can laser engrave your logo on these custom wrench bottle openers. They make great keychains and are at the ready when you need to pop a top. 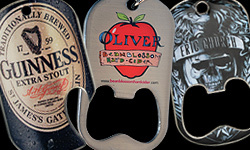 Offset printed dog tag bottle openers with a clear epoxy coating are great for highly detailed and full bleed images. Middle slot and side slot options available. Your logo or design is etched into grooves creating a cool 2d effect that can be filled with the colors of your choice. Both middle slot and side slot options are available. 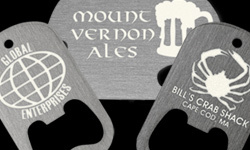 Laser engraved bottle openers are the most cost effective no color option in our promo catalog. 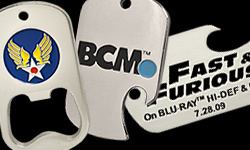 Harness the power of lasers and get your logo engraved on these dog tag bottle openers today. One of our favorite openers and best values. These custom bottle openers use state of the art digital printing technology and are produced at our factory in New York, which means they ship fast right to your door in a few days. Our best selling custom bottle opener. We've sold over 100,000 of credit card openers, which can be slipped right into a wallet. Your logo can be laser engreved or color printed onto the opener. A very cool way to promote your brand! Classic wrench-style bottle openers available in a wide range of color and are by far our most cost effective opener. They make great keychains and even better marketing giveaways for your business! A very cool no-color option in which your design is engraved into the opener using a diamond engraver. The detail that this process can achieve is amazing. An awesome way to promote your band or music venue! Available in aluminum and nickel plated zinc alloy. FREE 1" KEY RING WITH EACH OPENER. Even if you order 100,000 units we've got you covered. We'll fill your order quickly and accurately so all you have to do is open it up and hand it out! What is even cooler than a challenge coin? A bottle opener challenge coin. Available in multiple sizes, metals and styles. Order yours today. See some of the custom bottle openers we have produced for some of our customers. We have a wide selection of metal plating options to choose from. We offer numerous attachment options. Just let your sales rep know what you want or add it in the comments when you place your order..